African Fruit Beetle on my figs!! Hi Chris, I wanted to do a quick post before I start with a new work project. This darn thing is all over my figs. 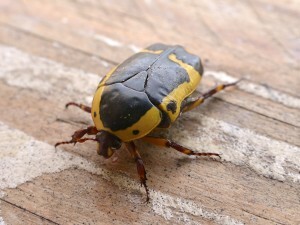 They are the African Fruit Beetle. Do you have these too? I did some research and found some interesting info. (Pachnoda sinuata) the garden fruit chafer or brown-and-yellow fruit chafer, is a species of beetle found in Africa from the Congo Basin southwards. These insect pests can cause extensive amounts of damage to crops. The big aha! for me was the grub! I did not know it came from this beetle!! I see it all over my garden when I dig in the veggie patch and the compost heep. The chickens love them! So that’s where they come from!! How do we get rid of these!!? I don’t have Har-dee-dars coming into my garden, so I have to try something else! I have the same problems with roses in pots – the beetle lays her eggs in the pots and the grubs appear – I have found drenching the pots with a litre of water mixed with 4mls of Karbasol results in all the grubs/worms coming to the surface and they can then be picked up and disposed of. I was told that the same happens to roses in the ground. Dear Neale, thank you so much for that very helpful tip. I am affraid I don’t know what Karbasol is…? Excuse my novice-ness! I’ll have to do my research on it or is it an organic product? I also have chickens that love these grubs, so it would be beneficial if they can still eat them. I’ve read about Karbasol a lot – its mentioned often in the Keith Kirsten books I have. Not sure if its organic. Thank you all for your very valuable feedback. I do agree that there is enough figs for me to keep us and friends happy with fresh figs, fig jam and fig preserves! I would be very unhappy to lose my birds and the grubs do make my chickens happy and healthy! Nature knows best! I also get the starlings in the fig tree early in the morning, so maybe they are eating the fruit beetles as well. I’ll have to hang up my feather duster! Hurray for birds! Hi Barbara, I have beetles and grubs too. Your beetle is more attractive than mine though. I took photos of a spider eating up one of those grub. Nature will take care of itself. If we remove them all, then the birds, praying mantis and spiders will go hungry. Since you have chicken roaming free, I should think they will be most happy to wipe them out for you. As if the beetles weren’t bad enough the grubs look horrid. They are huge! I’ve never seen those bugs on my figs! Fingers crossed otherwise I will be getting some chickens! I admit, I have no useful knowledge on beetle and/or grubs but I just wanted to say I love the concept of this blog/website. The structure and organization is useful and over all quite impressive. now please continue on with the beetle-ing. Hi my friend – I have been reading up on these beetles and bettles that attack fig trees in general. Seems this is a VERY common problem with figs world-wide. Lots of remedies but from what I’m reading, nothing works 100%. You got them because of the heat! They seem to become very active in very hot weather. Here are some suggestions I found for beetles on figs (not African fruit beetle, but they look the same, just the colouring is different). 1). Chickens love the grub! Its the “Chocolate-milkshake” in the chicken world! But the recent heat may have caused too many at once and your chickens can’t keep up. 2). Fill a spray bottle with warm water and 2 tablespoons of Imitation Vanilla Extract, shake to mix and spray onto the beetles. 3). Remove ALL the figs from the tree and wait for next year! 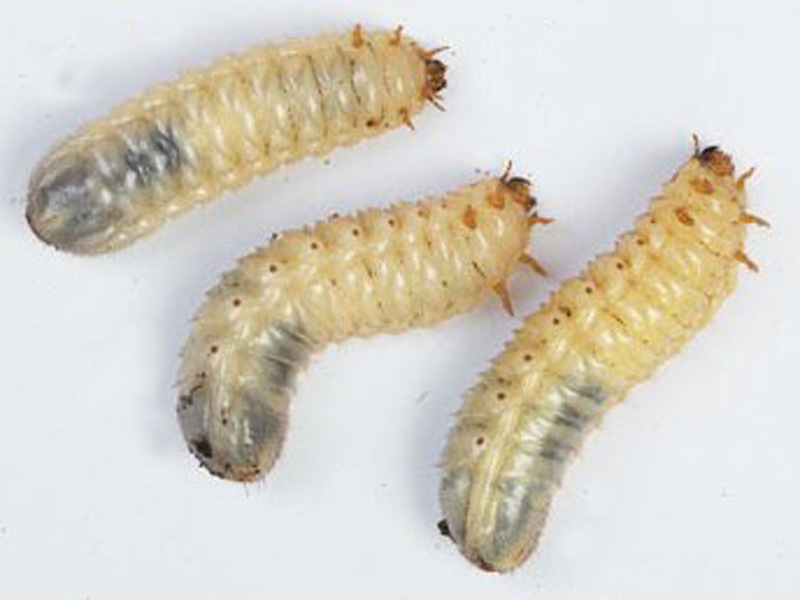 In the mean time try to kill the grub, but these grub are actually good for composting. 4). Put up a bird feeder. Starlings will eat all the bugs, with help from cardinals. Robins and cardinals eat the grubs, cardinals and starlings eat the adults. Put up a feeder and put out an ear of corn for the starlings, mounted on a nail. Ahhh … so the Hadedas have their uses hey?? Haha, I’ll keep that in mind next time I get cross with them for trampling all over my plants. Ok, i definitely don’t have grubs, but I DID have the ordinary Chafer beetles eating my roses and whatever else they were eating … I think they had a go at the Mona Lavender because I saw them there occassionally. But they left when I planted the garlic! I did spray with Ludwigs at the same time so I don’t know if it was Ludwigs or the Garlic that did it. But the garlic has cleared that bed that I planted it in of aphids and ants and I haven’t seen any chafer beetles since then either. Not sure though why … coincidental?